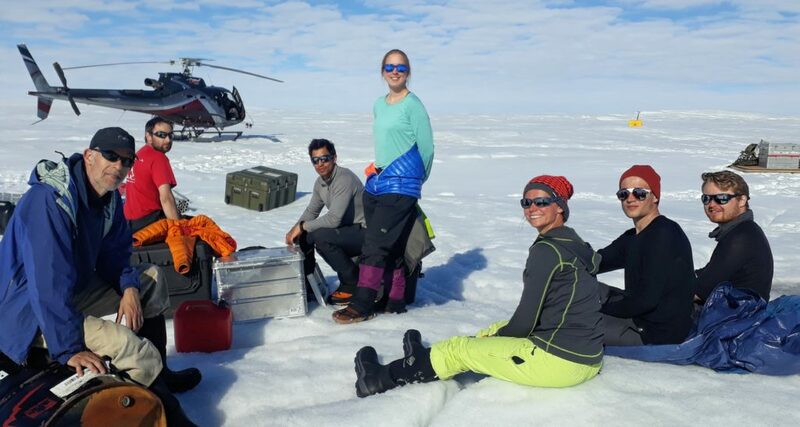 The RESPONDER team consists of an international group of scientists, primarily at the Scott Polar Research Institute at the University of Cambridge and the Centre for Glaciology at Aberystwyth University in Wales. Poul Christoffersen (PI) is a Reader in Glaciology at the Scott Polar Research Institute. His research focuses on glacier dynamics and ice-sheet interactions with the atmosphere and ocean, and on a broad scale the interactions of the global cryosphere with Earth’s climate system. He uses observations as well as theory and numerical models to advance knowledge and push the state-of-the-art in this field. His research, which includes glaciers in the wider Arctic as well as Antarctica, has been funded with seven grants from the UK Research Councils. He currently holds a Consolidator Grant awarded by the European Research Council under the European Union’s Horizon 2020 research and innovation programme. Marion Bougamont is a Researcher at the Scott Polar Research Institute who uses numerical models constrained by observations to develop a better understanding of ice sheets’ response to external forcing as well as ice sheets’ internal dynamics. Her current work includes numerical simulations of Store Glacier in Greenland and Pine Island Glacier in Antarctica, and she has previously worked with models of the land-terminating Kangerlussuaq sector in Greenland and the Siple Coast ice streams in Antarctica. Her work is funded by the European Union’s Horizon 2020 research and innovation programme as well as the UK Natural Environment Research Council. Charlotte Schoonman is a Researcher at the Scott Polar Research Institute. She uses geophones installed near the surface and close to the bed inside boreholes to produce high-resolution records of glacier motion. With a background in Earth science, she studies the processes at the interface between ice and sediment or rock. Antonio Abellan is a Researcher at the Scott Polar Research Institute. He uses time-lapse cameras and digital photogrammetry to study slope instability and ice-cliff collapse, which occur when calving glaciers produce icebergs. He has a background in Engineering Geology and his work is funded by a Marie Skłodowska-Curie grant from the European Union’s Horizon 2020 research and innovation programme. Tun Jan “TJ” Young is a graduate student at the Scott Polar Research Institute who specializes in ice-penetrating radar. He is using phase-sensitive radar in attended as well as autonomous modes to determine how fast ice deforms when glaciers flow rapidly, and how fast basal ice is melting due to friction and other sources of heat. Tom Chudley is a graduate student at the Scott Polar Research Institute who uses unmanned aircraft systems (UASs) and satellite imagery to track hydrological networks on, and beneath the Greenland Ice Sheet. His studentship is funded by the UK Natural Environment Research Council. Samuel Cook is a graduate student at the Scott Polar Research Institute who uses the Elmer/Ice finite element package to simulate the flow of Store Glacier and its hydrological networks. His studentship is funded by the UK Natural Environment Research Council. Robert Law is a graduate student at the Scott Polar Research Institute. He uses the scattering properties of fibre optics to obtain temperature and strain profiles, which will lead to better constraint in numerical models. His studentship is funded by the UK Natural Environment Council. Bryn Hubbard (Co-PI) is a Professor in Glaciology at Aberystwyth University. His track record includes 28 years of consecutive fieldwork to pursue glaciological studies on Arctic, Antarctic and Alpine glaciers. His current research includes high-latitude glaciers in Greenland and Antarctica, and high-altitude glaciers near Everest base camp in Nepal. In this project, he will develop and use a hot-water drill to gain access to the bed of Store Glacier in order to study subglacial drainage and its link to ice motion. Sam Doyle is a Researcher at Aberystwyth University. As an early-career scientist, he has gained extensive experience from more than fifteen expeditions to Greenland. In this project he will be responsible for developing and deploying wired probes and sensors for in situ investigations in boreholes drilled to the base of the Greenland ice sheet. We also work with a number of international partners in our research.